No doubt there are few in the Anglosphere who have ever clapped eyes on a painting or drawings by either Edward von Steinle (1810-86) or Leopold Bode (1831-1906)—which is a good reason to lament the fact that this book is in German only—and, at a guess, I doubt there are many in the German-speaking lands who have heard of them either. Late Romantic narrative illustrative art, in which these two artists excelled, was highly popular in the second half of the 19th century, but was completely occluded by the elite preferences for the avant-garde art and artists who dominated the "canon" until the revisions of postmodernism gave space to the "also rans" such as these men (and women, above all). This book is a catalogue of an exhibition that runs at Munich's Schack Museum (until 10 March) and then at the Clemens Sels Museum, Neuss (2 April-30 June). It not only includes plates of the 30 or so drawings and paintings in the show, but also many figures of works not included. 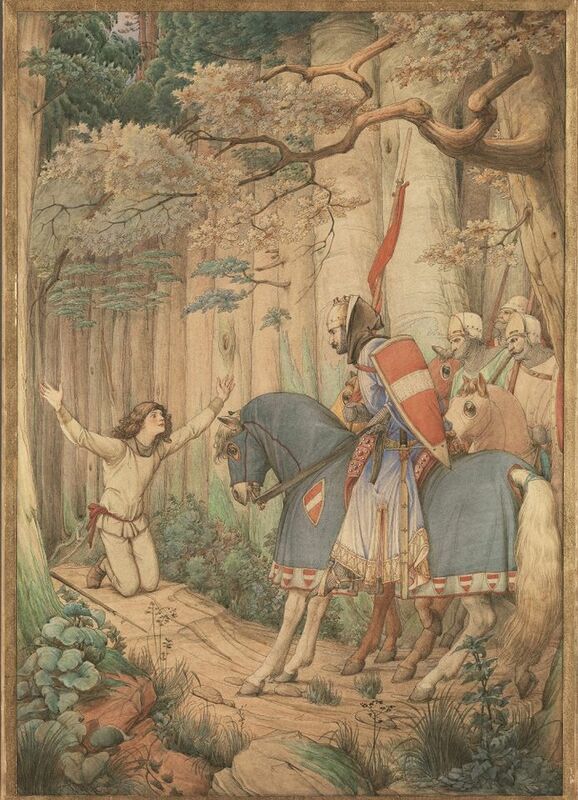 Von Steinle and Bode conjured up entrancing pictures drawn from the poetry of Clemens Brentano and Schiller, the fairy tales of the Grimm brothers, the romances of saints and knights of the High Middle Ages (here, Von Steinle’s Parsifal’s Meeting with the Knights in the Forest, 1884) and many visual descriptions of Shakespeare's plays (popular in Germany from the time of the Commonwealth). This is not everyone's cup of tea, but if for no other reason than to widen one's knowledge of art history, it is worth a look.